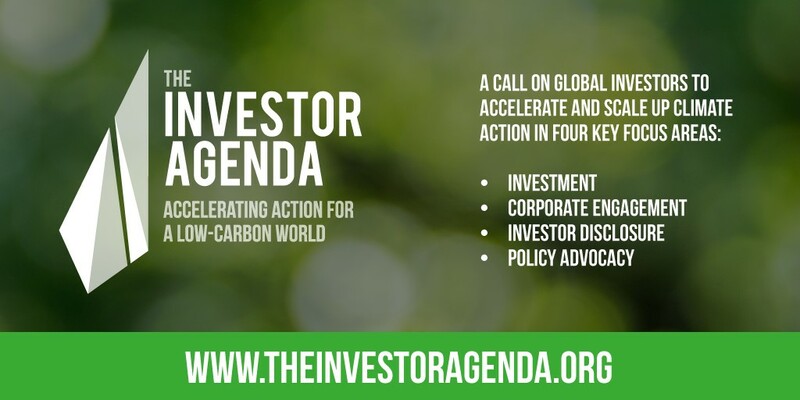 The Investor Agenda will bring together and promote the key actions that investors around the world are taking to meet the goals of the Paris Agreement and manage the risks of climate change. UNEP FI and six of its strategic global Partners – Asia Investor Group on Climate Change, CDP, Ceres, Investor Group on Climate Change, Institutional Investors Group on Climate Change, and the Principles for Responsible Investment launched this global initiative for investor coordination and collaboration on climate change during the 2018 Investor Summit on Climate Risk on 31 January, 2018 in New York. Large institutional investors as “universal owners” with highly diversified portfolios, as well as long-term investment horizons are particularly vulnerable to unabated climate change, and have a particular interest in the well-being and stability of the global economy. Currently, emissions associated with a few sectors, and the externalities that result from them threaten the prosperity of the entire economic system. The new platform will help the investor community weigh in on the politics and policies of climate change in a more focused manner than before. Investors will be encouraged to take action in four areas: investment, corporate engagement, investor disclosure and policy advocacy. This will mean taking action such as reporting existing low carbon investments and commitments, phasing out investments in thermal coal, signing up to initiatives such as the Climate Action 100+, disclosing their climate-related risks and opportunities, as well as engaging policy makers. UNEP FI will be mobilizing investors to take action via its work with the Portfolio Decarbonization Coalition, as well as helping investors to implement the recommendations of the Task Force on Climate-related Financial Disclosures with our pilot project. To find out more, visit the Investor Agenda website here.